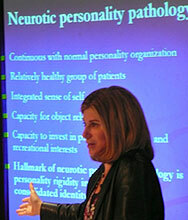 Eve Caligor, MD's, primary clinical and research interests are the evaluation and treatment of personality disorders. While there are different kinds of personality disorders, characterized by different clusters of traits and different levels of severity, core features common to all are identity disturbance and troubled interpersonal relationships. Working with collaborators at the PDI, Dr. Caligor has been developing the Structured Interview for Personality Organization (STIPO), a semi-structured interview for evaluating personality pathology that focuses on reliably assessing identity formation and quality of relationships. This work has been supported by the American Psychoanalytic Association and the International Psychoanalytic Association, and a preliminary report on the psychometric properties of the STIPO has been published in the Journal of Personality Assessment (Stern et al, 2010). In addition to assessment, Dr. Caligor is interested in treatment of personality disorders and in identifying the most effective psychotherapeutic approaches for different kinds of personality pathology. She has done published studies characterizing patients referred for psychoanalytic treatment (Caligor et al, 2003 and 2009), a first step in the process of developing empirically-based indications for psychoanalysis. In addition, she has been working for many years with colleagues at the PDI developing and studying transference-focused psychotherapy (TFP), an evidence-based psychodynamic psychotherapy for borderline personality disorder. This treatment focuses on the profound disturbances in the sense of self and experience of others and the stormy interpersonal relations characteristic of borderline personality disorder. Dr. Caligor is also interested in learning more about the efficacy of long-term treatments for personality pathology that is less severe than that seen in borderline personality disorder, but cause for significant impairment and distress nevertheless. Three treatments sometimes prescribed for these disorders are long-term cognitive behavioral therapy, supportive expressive therapy and psychoanalytic treatment. However, we know little about how well these treatments work, let alone which treatments work best for which patients. To begin to answer these questions, Dr. Caligor has been working with a consortium of psychotherapy researchers and clinical trials experts to develop and pilot a randomized clinical trial comparing the efficacy of cognitive behavioral therapy, supportive expressive therapy, and psychoanalytic treatment for patients with personality pathology of moderate severity. This project has been funded by the American Psychoanalytic Association and the Columbia University Center for Psychoanalytic Training and Research and the findings of the pilot study have been published in the Journal of the American Psychoanalytic Association (Caligor et al, 2012). As an educator and former Psychiatry residency training director, Dr. Caligor is intrigued by the possibility of applying her clinical and research expertise to residency education and psychotherapy training. She has developed novel approaches to psychodynamic psychotherapy training during residency, focusing on manualized, evidence-based treatments. In addition, in collaboration with Dr. Ze'ev Levin she developed a training program for residency training directors to help them better manage and mentor residents with personality pathology. She received an educational grant from the Program for Medical Education Innovations and Research (PrMEIR) at the NYU School of Medicine to pilot this intervention and to evaluate its effectiveness. Hersh R, Caligor E, Yeomans FE: Fundamentals of Transference-Focused Psychotherapy: Applications in Psychiatric and General Medical Settings. New York, Springer, 2017. Caligor E, Levy K, Yeomans FE: Narcissistic personality disorder: Diagnostic and clinical challenges. American Journal of Psychiatry, vol. 172, 5, 415-422, 2015. Caligor E, Roose SP, Hilsenroth MJ, Rutherford B: Developing a protocol for an outcome study of psychoanalysis. Psychoanalytic Inquiry, vol. 35 (sup.1), 150-168, 2015. Levy KN, Ehrenthal JC, Yeomans FE, Caligor E: The efficacy of psychotherapy: Focus on psychodynamic psychotherapy as an example. Psychodynamic Psychotherapy, vol. 42, 3, 2014, pp. 377–422. Deringer E, Caligor E: Supervision and responses of psychiatry residents to adverse patient events. Academic Psychiatry, 2014, pp. 1-7. Caligor E, Yeomans F, Levin Z: Personality Disorders. In Cutler JK (editor), Psychiatry, DSMV Edition, Oxford University Press, 2014, pp. 257- 290. Caligor E, Levin Z, Deringer E: Preparing Program Directors to Address Unprofessional Behavior. In Kalet A, Chou C (editors), Remediation in Medical Education. New York, Springer, 2014, pp 285-296. Caligor E: Narcissism in the Psychodynamic Diagnostic Manual. In Ogrodniczuk, J: Treating Pathological Narcissism. Washington DC, APA Book, 2013, pp. 63-79. Yeomans FE, Levy K, Caligor E: Transference-focused psychotherapy. Psychotherapy, vol. 50, 3, 2013, pp.449- 453. Zerbo E, Cohen S, Bielska W, Caligor E: Transference-focused psychotherapy in the general psychiatry residency: A useful and applicable model for residents in acute clinical settings. Psychodynamic Psychotherapy, 2013, pp. 164-181. Caligor E, Hilsenroth MJ, Devlin M, Rutherford BR, Terry M, Roose SP: Will patients accept randomization to psychoanalysis? A feasibility study. Journal of the American Psychoanalytic Association, vol. 60, 2, 2012, pp. 337-360. Horz S, Clarkin J, Stern B, Caligor E: The Structured Interview of Personality Organization (STIPO): An Instrument to Assess Severity and Change of Personality Pathology. In Levy R, Ablon S (editors), Handbook of Evidence-Based Psychodynamic Psychotherapy, 3rd Edition. New York, Humana Press, pp 2012, 571-92. Stern BL, Caligor E, Clarkin JF, Critchfield KL, MacCornack V, Lenzenweger MF, Kernberg OF: The Structured Interview of Personality Organization (STIPO): Preliminary Psychometrics in a Clinical Sample. Journal of Psychological Assessment, 91, Vol. 1, 2010, pp 35-44. Back to PDI Professionals: Staff and Fellows.